Fundamental factors and signals, super-charged with AI. Why hire analysts when AI can process an enormous amount of rule-based analysis faster, more accurately, and cheaper. Give your users and customers a better and more intelligent experience. Kavout delivers machine learning powered factors and signals of thousands of equities around the globe 24 x 7. Aim to reduce time spent on research, increase discovery of new ideas, and minimize downside and risk. Design investment strategies and risk models with the help of rule-based, quantitative metrics, factors, and signals. Get notified with hundreds of metrics such as price to earnings ratio, Piotroski F Score, and greater than average gross margin. Slice and dice information by sector, by market capitalization, by region, and many more. Kavout partners with businesses to deliver platform-as-a-service (PaaS) and software-as-a-service (SaaS) solutions to your customers and to your users internally. Users can subscribe to, and receive notifications on pre-determined value dimensions, in addition to custom screeners. The belief of value investing is that “cheaply” valued equities tend to outperform stocks with high P/E ratios over a long horizon. Common valuation ratios are, but are not limited to, price to earnings, enterprise value/operating cash flows, and Greenblatt magic formula. 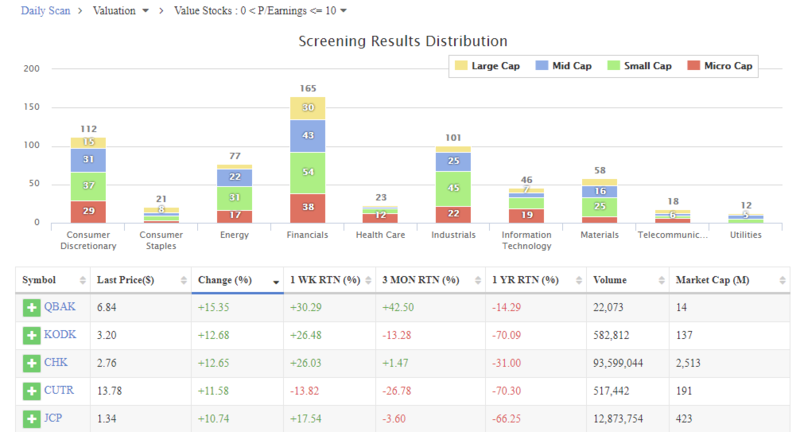 Instantly discover companies that meet selected valuation ratio criteria. Then refine research with additional qualifiers such as sector, market capitalization, trading volume and more. Users can subscribe to, and receive notifications on pre-defined quality dimensions, in addition to custom screeners. Nobel laureates Eugene Fama and Kenneth French, economists known for their factor investing (company size, company value, and market risk), revised their model to add profitability (a quality-related factor) and growth. Kavout applies rule-based machine learning to calculate a company’s relative strength in the quality factor in relation to its industry average 24 x7. Examples are return-on-equity, net profit margin, and gross profitability. Interested in knowing the strength of a firm’s financial position? Gain access to companies with Piotroski F Score that are greater than 8 or lower than 2. How about companies that have a higher risk of bankruptcy? We regularly scan and rate firms using Altman Z Score so you can be alerted and cross-validate your research. Users can subscribe to, and receive notifications on pre-defined growth dimensions, in addition to custom screeners. Growth strategies can be different for different investors. A common understanding of “growth” is that a company has substantial potential for capital appreciation. 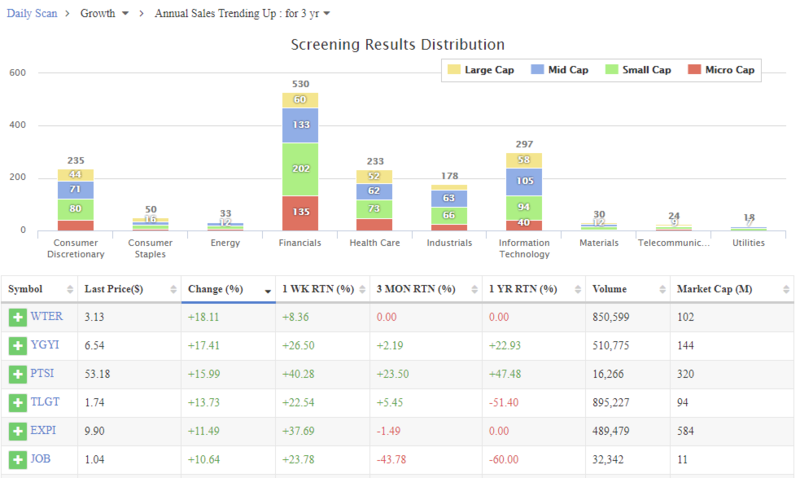 Whether users researching small-cap stocks or looking at technology or healthcare stocks, we screen and filter companies that meet certain growth indicators. These may include consecutive annual sales growth, EPS trending up year over year, and net profit growth greater than the industry average and more. Instantly discover companies that meet selected growth factor criteria. Then refine research with additional qualifiers such as sector, market capitalization, trading volume and more. Users can subscribe to, and receive notifications on pre-defined momentum dimensions, in addition to custom screeners. Momentum is considered a “persistence” factor, that is it tends to benefit from continued trends in markets. Research has shown that the strategy of buying stocks that have done well and selling stocks that have done poorly generated significant positive returns over 3- to 12- months holding periods. A great variety of rule-based calculations, powered by AI, are used to capture price and volume movements around the clock. Examples are price momentum for one month or for one year, and trade volume increases or decrease at a meaningful percentage. Our customers are able to keep a pulse on the market dynamics at all times. Cost effective and fast implementation. Our services are available for co-branded or white labeling delivery.